Barbara Ann McIlvaine Tingom was born in Abington, Pennsylvania, a suburb of Philadelphia, on March 30th, 1949. She was born a preemie and not expected to survive. She was the first of two children, and had a younger brother named Alan. Both she and her brother were named after their parents. As a child, she played with Mary Hoyer dolls and later sailed with her dad. In high school she played field hockey, and graduated from Wissahickon High School in 1967. During her teens and into college she would spend summers at the beach in Ocean City, New Jersey where it was cooler. Barbara would stay with her grandparents at their summer home. Her Aunt Gladys lived across the street on the beach. Her mother and aunt taught her to sew during those summers. She learned to sail on the ocean with her dad, brother Alan, and cousin Tommy at the Ocean City Yacht Club. She sailed on Moth and Comet sailboats and participated in racing events. During the summer months, Barbara also worked at a candy shop on the Boardwalk selling salt-water taffy. Barbara went on to attend Susquehanna University in Selins Grove, Pennsylvania. At Susquehanna she played left fullback on the women’s field hockey team. 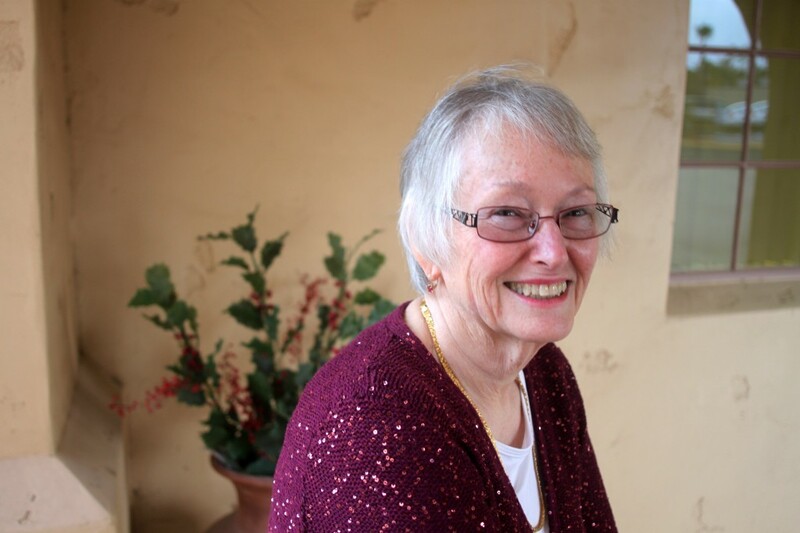 When Barbara’s parents moved to Scottsdale in the early 1970s, she decided to visit. She immediately fell in love with the palm trees and warm winter-temperatures of Arizona. Barbara moved to Arizona before her 25th birthday and bought a small patio home in Scottsdale. During those years, Barbara worked processing insurance claims. She often shared stories about how she could process twice as many claims as her coworkers by processing the newest claims first. Then, she met a guy named George with a small sailboat who liked to sail for fun. She challenged him, saying, “You do not know how to sail if you don’t know how to race.” This was the beginning of nearly 40 years together, and a family sport of sailboat racing. George and Barbara were married on April 19th, 1976. They were married at St. Luke’s Hospital Chapel in Phoenix and honeymooned in Mazatlan, Mexico. Growing up, Barbara attended a liberal church in Pennsylvania, and not liking the denomination George had been with since his childhood, they set out as a married couple to find a new church home. They soon found a church in Scottsdale that they attended. It was within walking distance of their home. Barbara always felt that it was there that she became a Christian. A few years later, Brook was born in May of 1978, and Christopher was born in February of 1980. Being a mother was the most important part of life to Barbara, along with her marriage to George. Teaching and educating her two children was a major extension of mothering and something she loved. In the mid 1980s Barbara founded a support group in Phoenix for homeschoolers called Eastside Explorers, which is still active today. She was also involved with the state home schooling group called AFHE, the Arizona Families for Home Education, and was president for a year. In June of 1990 the family moved to St. Louis, Missouri, when George accepted a new job. Then, in 1995 the family moved back to Scottsdale. While in St. Louis she learned and practiced home decorating as a hobby. Barbara encouraged Chris in his pursuit of the Eagle Scout award, which he earned in 1994. Barbara encouraged Brook to stay in touch with friends, which developed into a magazine for girls called “Kindred Spirits.” Through this magazine Brook met her future husband, Israel; married in 1999 and now have seven children and live in Michigan. Chris and Jana married in 2010; they have one child and live in Scottsdale. About 10 years ago, the Tingom family joined Calvin Orthodox Presbyterian Church in Phoenix. George and Barbara say it was one of the best decisions they have ever made. Barbara enjoyed teaching 3rd and 4th grade Sunday School for a number of years. In recent years Barbara developed a passion for smocking and sewing. She made dozens of heirloom dresses and outfits for her grandchildren. She was president of the Desert Rows Smocking Guild for a year. She developed and fostered many friendships through her smocking. An important character trait to Barb was honesty. She held herself to a high standard and looked for the same in others. Barb loved to travel. In the early ‘70s she visited Europe for the first time, and saw England, Spain, Luxemburg, Austria, Switzerland, Germany, and the Netherlands. In the 1980s Barb and George travelled to Hawaii, Bermuda, and many sailing trips to Catalina Island. In recent years, she and George have travelled to Maine, France and Ireland. They have taken Chris with them on trips to Italy, Brazil, Norway, Sweden, England, Vancouver, and Alaska. Barb managed to visit 49 to 50 states (she couldn’t recall visiting Alabama). In recent years, Barb researched and improved her health considerably, but in March on her 63rd birthday she was diagnosed with bladder and bone cancer. Despite every effort to combat the disease, she succumbed on November 30, 2012 surrounded by her family. She is now at home with her Savior in Heaven, Jesus Christ. Barbara leaves behind her husband, George, and their two children Brook and Chris, and son-in-law Israel, and daughter-in-law Jana, along with eight grandchildren ages 1 to 12. Her grandchildren are: Benjamin, Cherish, Isaac, Josiah, Eden, Caleb and Charity in Michigan, and Emily in Arizona.